NEW: The 2019 City Visitor Guides for Alaska are IN! NEW: The 2019 Anchorage Map and Updated Relocation Guides are IN! 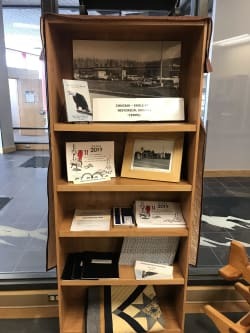 The Chugiak-Eagle River Chamber operates a year-round visitor and community information center. All of the regional guides throughout the road system in Alaska are carried at the center and available for pickup. Visitor and community information on many smaller vendors operating everything from flight seeing to fly fishing, rafting to charter operations is also on hand. Business members are encouraged to provide the office with their contact information and brochures where appropriate. The Chamber also serves the community through responding to resident inquiries, new arrivals to our community, as well as providing referrals to our our local business members and appropriate government and nonprofit agencies. We are happy to help you! Stop by our offices located in the Eagle River Town Center, across the hall from the Chugiak-Eagle River library at 12001 Business Blvd. Suite 108. Our office hours are 9am – 4pm Monday through Friday. If we happen to be closed, we may be at meetings but promise to return shortly. 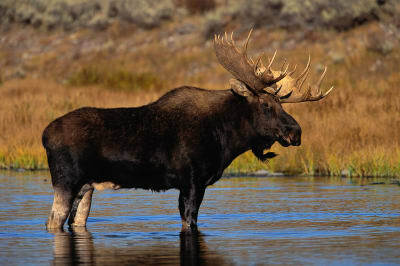 Our campgrounds are open in the summer only and are the pride and joy of Alaska State Parks. These beautiful sites provide recreational access to Chugach State Park - 495,000 acres of pristine wilderness which borders all of the Municipality of Anchorage. For more information on Chugach State Park, visit alaska.gov/parks. EAGLE RIVER CAMPGROUND (State) has camping sites for 50, as well as a developed day use area. 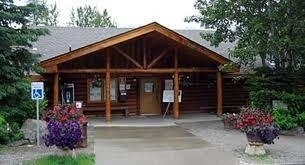 This campground is located on the banks of Eagle River directly off the Glenn Highway. (Take the Hiland Road exit off the Glenn Highway - follow the frontage road down to Eagle River.) Seasonal reservations for some sites can be made by calling 907-694-7982 from May into September, or year round at 907-746-4644. EKLUTNA STATE CAMPGROUND (State) is located approximately 10 miles off the Glenn Highway in Chugach State Park on the shores of Eklutna Lake. (Take the Eklutna Exit). This scenic area provides excellent hiking and boating opportunities. The campground has 50 sites, drinking water, latrines, and a 15 day camping limit. Hiking trailheads in the area include: Twin Peaks, Lakeside and Bold Ridge. Activity concessions are available adjacent to the campground and include kayak and bike rentals. Chugiak-Eagle River is a community under the municipal government of Anchorage. The community has experienced very rapid growth over the past thirty years with the population doubling between 1980 and 1990 from 12,858 to 25,324. By 2000 the population was 29,915 and in the recent 2010 census, grew to 34,982 --a 38 percent increase over the past 20 years. The Alaska Department of Labor’s estimated population mid-decade for Chugiak-Eagle River is 35,600. The community represents about 12 percent of the population within the Municipality of Anchorage. According to the 2010 census, approximately 65 percent of our population is married and 62 percent work in the private sector. This community is strongly rooted in the military with 21 percent of residents 18 years of age and older identify themselves as having military/veteran status. 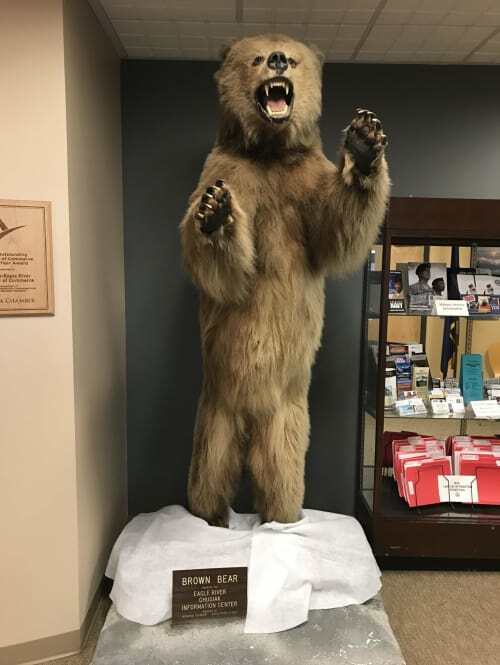 In addition, Chugiak-Eagle River is a well educated community with 37% of the population with college degrees compared to Alaska at 26% and the United States at 27%. The Chugiak-Eagle River Chamber of Commerce supports economic development and economic diversity that complements the community oriented nature of this area. Our business community is largely service/retail oriented. Industrial land is available for development in the vicinity of the Birchwood Airport and points north through Eklutna. The surrounding scenic state park land offers many opportunities for tourism services to complement the growing visitor industry in the state of Alaska. Chugiak-Eagle River is surrounded by beautiful and rugged Alaska wilderness. Bordered on the East is Chugach State Park – 495,000 acres of pristine wilderness with gateway access from a variety of locations within the community. Hiking trails are abundant and animals are close at hand. Several of the highlights of the area are below. THUNDERBIRD FALLS is located in the northern part of our community and is the terminus of a comfortable one mile family walk on a well maintained trail. It is a must see for all who visit this area. EKLUTNA VILLAGE HISTORICAL PARK is centered in the native village of Eklutna. This site is the home of St. Nicholas Russian Orthodox Church. The church, documented as the oldest building in Anchorage with a construction date of approximately 1830, provides a glimpse into the historic Russian influence in the region. 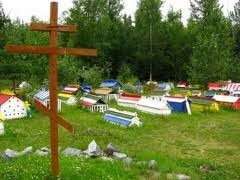 On the church grounds are brightly colored native spirit houses that rise above the graves in the ancestral burial ground. Eklutna Village Historical Park is part of the Orthodox Church. Please call to arrange for visiting from mid May through mid September for tours. Phone (907)-688-6026 May-September. 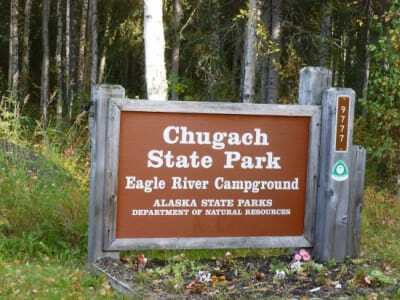 The CHUGACH STATE PARK EAGLE RIVER NATURE CENTER is located at mile 12 of Eagle River Road and provides the gateway to Chugach State Park. This facility, operated by Friends of Eagle River Nature Center, offers "hands on" interpretive nature displays, junior naturalist programs, special interest classes, as well as self-guided trails into the Park. Volunteers are available to help answer questions and direct hikers. Parking fee required. Summer and winter staffing hours vary. Call (907) 694-2108. SOUTH FORK FALLS, located out Hiland Road adjacent to Spirit Park, is another natural treasure for visitors and residents alike. MT. BALDY, located at the top of Skyline Dr. is a short, yet steep hiking trail that also opens up to other mountain trials. At the top is a beautiful view Anchorage, Eagle River, Chugiak and North to Wasilla and Palmer. The Anchorage School District provides public education for the Chugiak-Eagle River community. The District’s main offices are located in Anchorage and can be reached at 742-4000. There are twelve public schools in the Chugiak-Eagle River area serving the needs of our youth. The private sector provides almost all health care needs in Chugiak-Eagle River. Search our membership directory for professionals in the following fields: physicians, dentists, chiropractors, physical therapists, counselors, nurse practitioners, and opticians. Chugiak-Eagle River hospital care is located on either side of the community. All hospitals are accessed within 25 to 35 minutes from downtown. To the south Anchorage hospitals include Alaska Regional Hospital, Providence Alaska Medical Center, and Alaska Native Medical Center. For our military families, Joint Base Elmendorf-Richardson (JBER) also a full hospital on base. To the north is Mat-Su Regional Medical Center located close to the junction of the Parks & Glenn Highway in the Mat-Su Valley.